Want to know all about the Sacraments in a handy, short reference format? 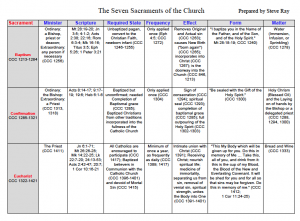 Download this link and print out your own 2-page chart — Seven Sacraments of the Catholic Church. It gives you references from the Bible and the Catechism. This chart was made to go with my 7 talk series on the Sacraments: Food for the Journey, Weapons for the War. You can purchase this set by clicking here. I had to fight my way into the Church! In the process I learned a lot about the Catholic truth and the Sacraments. This series was done in front of a live audience and is presented first from my old Evangelical perspective. I explain what I thought and taught as a Protestant. Then I step to the other podium and argue with my old view and explain the Catholic teaching on the Sacraments. It is full of stories, anecdotes and examples. A handy thing. The question I was wondering about recently does not seem to covered. That is, what sacraments can a deacon perform? I am pretty sure they can perform baptisms and witness marriages. There is no indication of that on the chart. Are there more? Can they do the sacrament of the sick? The other thing I wondered about is Holy Orders. Is says it is done only once with separate ordinations for deacon and bishop. Are those ordinations not sacramental? What about when somebody becomes pope? Is that another ordination? I’m no expert, but yes a deacon can baptize and witness a marriage. And, I don’t think the pope goes through another type of ordination; he simply is elevated to the position. An exception to this is if the pope-elect is not a bishop (any Catholic male can be elected pope, even a layman), at which point he is promptly ordained as Bishop of Rome. Oh, to whom do I write to get permission to use this as a handout for the Catechism class? Steve, sorry to point this out but in the Eucharist under “Form” you have “drink from it twice”… otherwise it is great!!!! Chris: Please feel free to copy for your own use and the use of your class. I would only object to someone selling them or promoting them as their own. For you and your class — no problem. Tom: Thanks for the note about the missprint. I fixed it! There are three orders that are part of Holy Orders: Bishop, Priest, and Deacon. A man is ordained a bishop. The episcopal ordination confers upon the bishop the FULLNESS of the priesthood. If you haven’t ever attended an episcopal ordination I would highly recommend it. As moving as a priestly ordination is, an episcopal ordination is a truly magnificent celebration. The Pope is not ordained because he already holds the fullness of the priesthood – he is (normally) already a bishop. In my chart I only had priest as the minister of baptism. I had neglected to add “deacon.” It is now corrected. I was reminded by a good deacon! The ordinary minister for baptism is a bishop, presbyter, or a deacon, Canon 861-&1. (You have just â€œpriestâ€). However, Canon 677, 1-2 of the Eastern code speaks only of a priest as the ordinary minister of baptism, since chrismation, which only a priest can confer, immediately follows baptism in ordinary situations. The deacon may serve only as an extraordinary minister of baptism in cases of necessity (Eastern Rite.) The conciliar directive that deacons confer solemn baptism entered canon law with Paul VI, June 18, 1967. New Commentary of the Code of Canon Law, pge 1049. Donâ€™t worry, my feelings arenâ€™t hurt. Veronica: We are told in the writings of Justin Martyr (100-165) – the first to ever write about the celebration of the Mass – that they read the memoirs of the apostles and prophets. Since they did not have a closed canon yet, he was basically saying "Each Sunday the priest reads from the Old and New Testaments." I am sure the reason we do so is because both Old and New Testaments are equally God's inspired word. The New is built on the Old, much like a house is built on a foundation. I usually call the Old Testament the Foundational Testament and the New is the Fulfillment Testament. The Church has always believed we should know and love both the Old and the New and so she has us read them both in the liturgy. Steve, the missprint “drink from it” is still there… I would just save it and fix it myself, but can’t. Thanks for this very helpful chart! I see the “drink from it” error still there, and I also don’t see deacon listed for baptism or marriage. I’m not trying to be nitpicky, but if you could correct these issues, it would be great, since most folks don’t have the appropriate software to edit PDF files to make their own corrections before they print. It is NOW fixed. I had it changed but the old file was still lingering on the server. I deleted it so the revised version would step to the front. It is now correct. Thanks for your help and persistence. Thanks for fixing this Steve, and thanks for all you have done and ever will do for the Church! Can ‘anointing of the sick’ be administered by a Deacon? I thought I heard a talk by a Deacon on Catholic.com and understood that it can be. Jothish: Deacons cannot anoint with oil for the sick. It is only a bishop or a priest – CCC 1516. Thank you, Steve. I am also leading a group of very enthusiastic Boy Scouts and can’t wait to share this with them. God bless you! Thank you for this, Steve. Requesting your permission to reprint this in our parish newsletter this February 2013. It’s an excellent resource for the YOF. Mabuhay from the Philippines! STEVE RAY HERE: YOU ARE FREE TO USE IT BUT GIVE CREDIT AND REFER THE RECIPIENTS TO MY WEBSITE. Thanks! Steve, I’ll make sure that proper attribution is given. I’ll send you a soft copy :) Thank you! Not sure why “Annointing of the Sick” is lumped with “Last Rites”, because Last Rites is not synonymous, but is actually 3 sacraments (Confession, Annointing, and Viaticum/Eucharist); so I think that is a bit confusing as listed..? In Western church, I wonder if “have received the Sacrament of Reconciliation” is an added “Required State” for Eucharist, since Fr. John Harden mentioned children are required to receive first Reconciliation before the sacrament of Eucharist. (?) (Being aware, in Eastern rite, this prerequisite does not apply.) ?? And should “Required State” for Matrimony and Confirmation include “grave obligation to be in the state of grace” as Fr. Hardon mentions In Q&A of Catechism. I would actually use “Matrimony” for the sacrament name versus “Marriage”. Because as I understand it, you can have marriage without the sacrament of Matrimony??? Perhaps I’m wrong. Would you mind if I add the actual ‘definition’ of each sacrament in the Sacrament column, for using this chart for my youth? And add the ‘definition’ in parenthesis after Form (i.e., words pronounced) and after Matter (ie., materials used and action performed). The words of consecration changed in the Novus Ordo mass, so how is it possible that the sacrament of Holy Communion is valid? One cannot baptize in the name of the Creator, Redeemer and Sanctifier and think the baptism is valid. STEVE RAY HERE: I have no idea what you are talking about! Show me in official Catholic document or in the General Instruction of the Roman Missal where is says “Creator, Redeemer, Sanctifier.” Not sure where you attend Mass, but if they say that I would find a proper Novo Ordo celebration. Hello- Can you reactivate the link for your document? It is very helpful! I click on the link to the document and it says it doesn't exist anymore. At the link to purchase the seven talk series this is what I find: The page you were looking for appears to have been moved, deleted or does not exist. I am writing this in view of the recent news that a priest in Spain has an App for Confession so that people who are not able to find a priest can use this app to confess. I know that Confession is valid if only it's done in person to a Priest / Bishop. Heard a talk by Fr. Mike Schmitz that for confession the 'Matter' also includes the Priest. Wondering whether this should be in your chart? Steve Ray here: That is a good point and I will consider it. I think everyone realizes that confession has to be to a priest in person but I may have to edit the chart to reflect that. Thanks for the insightful comments. Next post: Jesus Was A Jew – So What is That To You?